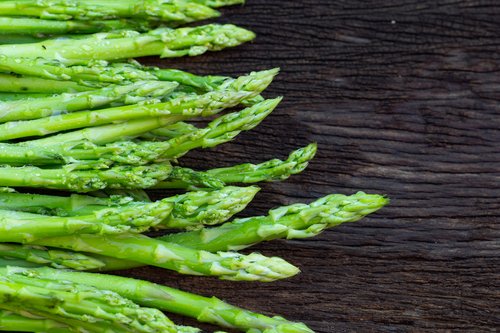 This spring superfood is packed with vitamins and minerals that there are many health benefits to be gained from adding asparagus to your dinner plate. There are many ways to enjoy asparagus, including grilled, roasted and steamed. No matter how you enjoy your asparagus, just a few of its health benefits are listed below. Asparagus is a super low-calorie vegetable. A 100 grams of fresh spears is only about 20 calories. Asparagus also hard to digest, so it fits into the category of low and negative calorie vegetables. Asparagus is a great source of vitamins A, C, E and K. It also is high in fiber and folate. It is a source of chromium, which is a trace mineral that enhances the body’s ability to transport glucose from the bloodstream into the cells. This is helpful if you are watching your blood sugar levels. It is very high in folate, a B vitamin that has been found to improve moods and help ward off irritability. Researchers have found a link between low levels of vitamin B12 and folate and depression, which has led some doctors to prescribe daily doses of both B vitamins to patients with depression. Asparagus also has high levels of tryptophan, which is the amino acid that has been similarly linked to improved moods. Folate does not only boost your mood, it also helps fight cognitive decline, dementia and Alzheimer’s. To get this benefit from asparagus, you need to pair it with foods that have high levels of vitamin B12, such as dairy, meat, fish and poultry. In a study done by Tufts University, researchers found that older adults with healthy levels of folate and vitamin B12 performed better on tests of mental flexibility and response speeds. The high levels of amino acid in asparagus makes it a natural diuretic. It also increases urination, which helps to reduce the excess salt in the body. This is very beneficial for people who suffer from high blood pressure and edema. Along with Brussels sprouts, kale, and avocado, asparagus is rich in glutathione. Glutathione is a detoxifying compound that helps break down carcinogens and other damaging compounds, like free radicals. It is possible that eating asparagus on a daily basis may help reduce risk and fight certain forms of cancer, like lung, larynx, colon, bone and breast cancers. Researchers now know that asparagus can help women have a healthy pregnancy. There is a significant amount of folate in asparagus, which makes it an important vegetable choice for women who want to have children. There are also studies that show asparagus is effective in improving the quality and quantity of the breast milk while boosting the appetite of nursing women. So, it’s essential for women who are planning to become pregnant to get enough folate because it can decrease the risk of neural-tube defects and low birth weight in fetuses. Folate works along with vitamin C and vitamin B12 to help the body break down, use and create new proteins. It also helps with the formation of red blood cells and produces DNA, which is the building block of the human body that carries the genetic information of the baby. Bloating is a common issue that many people face daily. While it is not painful for most people, it is a sign of digestive health. Asparagus promotes overall digestive health due to its high levels of fibre and vitamins. It is also high in probiotics, which are carbohydrates that cannot be digested and help to boost healthy good bacteria in your digestive tract. These probiotics help to reduce bloating and gas, so you can say goodbye to embarrassing belly bulge. Most of us crave a greasy breakfast in the morning after having one too many alcoholic drinks. However, research suggests that loading up on asparagus may be the better choice to cure a hangover. A 2009 study, published in the Journal of Food Science, found that laboratory-grown cells suggested that the amino acids and minerals in asparagus may help reduce hangovers and protect the liver cells from toxins found in alcohol. Who knew that adding vegetables to your diet could fight hangovers? There has been a lot of talk about antioxidants in the last decade because they help fight free radicals. Purple asparagus is full of anthocyanins, which gives the vegetable the purple, blue and red hues. Anthocyanin is a powerful antioxidant, but is one of the harder antioxidants to add to your diet. When cooking asparagus, try not to undercook or overcook it. While cooking asparagus helps activate the antioxidants and cancer-fighting potential, letting it sautè or boil too long can negate some of its nutritional benefits. While it may make your urine smell for a few days, eating asparagus is important for a healthy urinary tract. The amino acids in asparagus are a natural diuretic, which flushes excess salts and fluids from your body. These acids also help reduce your risk of urinary tract infections. For many people, losing weight is their goal and it can be a challenge. Asparagus is low in calories and fats, and high in fibre. The high levels of fibre mean that it takes longer to digest, so you feel full between meals. To help you keep feeling full, it is recommended to pair asparagus with protein, like a hard-boiled egg. Vitamin E is an important antioxidant because it strengthens the immune system and protects cells from free radical damage. The best way of getting vitamin E from asparagus is to cook it with a healthy oil like olive oil, so you are getting a healthy fat and the vitamin E.
Like other green, leafy vegetables, asparagus is filled with vitamin K. Vitamin K is important for the process of coagulation, which helps stops cuts from bleeding. It also helps with bone health because vitamin K aids the body in its absorption of calcium. Vitamin K is also a major player in supporting heart health. It helps to prevent hardening of the arteries, which includes keeping calcium out of your artery linings and other body tissues, where it can cause damage. Why does Asparagus Make My Urine Smell? Mercaptan is what causes asparagus to make urine smell. The process of breaking down of mercaptan by the digestive system only takes 15 to 30 minutes of eating asparagus. However, this does not happen to everyone and the smell depends on your genetic makeup. There are no harmful effects of the compounds or the odor, so there is no need to worry about eating asparagus. Asparagus is a commonly overlooked vegetable that more of us should be enjoying in our diet, especially in the spring when it is in season. There are many ways of preparing asparagus, either cooked or raw, so you should really give it another shot. Asparagus has a delicate flavor and can be eaten raw, steamed, roasted or grilled. You can also add it as an ingredient to pickles, soups, and salad recipes. When you are shopping for asparagus at most supermarkets, you will most likely find green asparagus. However, there are two other types of asparagus that you can choose from. The white asparagus from Spain that is more delicate and difficult to harvest and the purple asparagus from France that is smaller and has a fruitier flavor. So, if you have never had asparagus before, keep an open mind and give it a try.